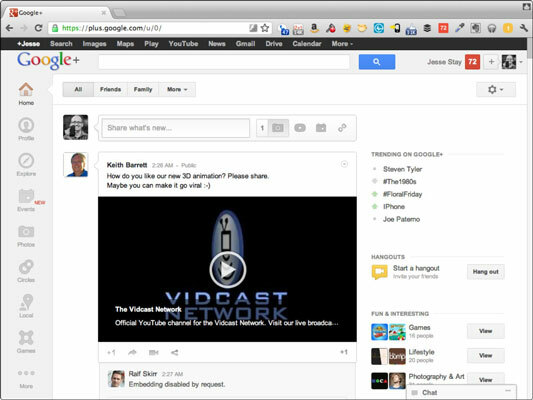 Click the Hangouts button at the left of the Google Plus page and then click the Start a Hangout button to the right on the page. You can also just click the Start a Hangout button in the right column of your News Feed. A window pops up, giving you the option to add some more information before you start. If this is your first time, you might also be asked to install a plugin. In that case, follow the instructions, and you’ll return to this step in no time. Choose which circles or people you want to invite to your Hangout. This is the cool part of Hangouts — you get to select exactly who you want to invite. Select Your Circles if you want to invite anyone you’ve circled, or type in individual names of people to invite. You can always bite the bullet and just invite everyone by choosing Public as well — just keep in mind that your Hangout may fill up really fast (which might be a good thing). Select a name for your Hangout. When people are looking under the Hangouts section in Google+ for Hangouts occurring in their circles, this is the name they will see. They can also search for Hangouts, and your Hangout will appear if it fits in their search query. 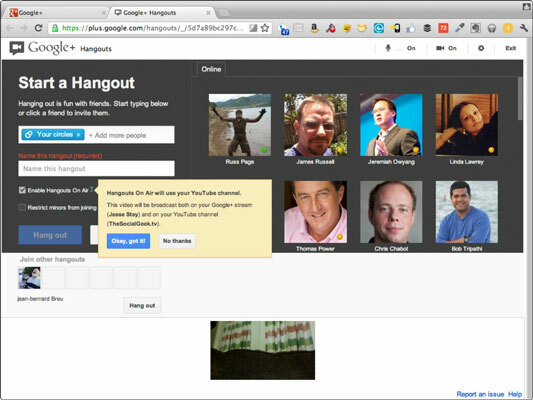 Decide if you want to publish your Hangout to the world with Hangouts On Air. Below this option are other choices, including whether to allow minors to watch the Hangout. If you’re talking about adult topics, you might want (or even need, depending on what the laws require where you are) to check this box. Check your hair, do your makeup, adjust your glasses, and then just click the Hang Out button. Doing so invites your friends to the Hangout, and they’ll see the Hangout in their streams. Soon, friends who want to join you in the Hangout will start joining your Hangout and participating in the conversation with you. You can also start a Hangout as your brand. To do so, you switch to your brand’s account by clicking your name, selecting your Google+ page name, and then following the steps above when the new window appears. Just note that your own computer’s camera will be used; make sure that the people you want to represent the brand are the people in front of that camera. Your Brand Hangout then shows up as “Your Google+ Page Name hung out with x people” in the news feeds of people following your Google+ page. Visitors to the Hangout see, in the Hangout video, the people you’ve chosen to represent your brand. The Hangouts feature procedures provided here could change if Google+ ever changes its design.